43118 Intermediate Cars for the "Blue Star Train"
87281 IC Car Set, 1st Class. 87282 IC Car Set, 2nd Class. Prototype: German Railroad, Inc. (DB AG) class 232 "Ludmilla". Model: The locomotive is constructed of metal and has an mfx digital decoder, a special can motor with a flywheel, and controllable sound functions. 4 axles powered. Traction tires. The triple headlights change over with the direction of travel, will work in conventional operation, and can be controlled digitally. The headlights are maintenance-free LEDs. The locomotive is decorated with themes from the world of "Looney Tunes". Length over the buffers 23.9cm / 9-7/16". Prototype: German Railroad Inc. (DB AG) class 120.1 general-purpose express locomotive. Promotional paint scheme "Märklin my world". The locomotive looks as it did in May of 2012. Model: The locomotive has an mfx digital decoder and comes from the factory with sound functions that can be turned on and off. It also has controlled high-efficiency propulsion. 2 axles powered. Traction tires. The triple headlights and dual red marker lights change over with the direction of travel, will work in conventional operation, and can be controlled digitally. The headlights are maintenance-free, warm white LEDs. The engineer's cab lighting can also be controlled digitally. The locomotive has separately applied grab irons. Length over the buffers 22.1 cm / 8-11/16". Warm white LEDs for the headlights and cab lighting. Digital sound effects: horn and station announcements. Prototype: German Federal Railroad (DB) class 103.1 electric locomotive in a "simplified TEE paint scheme" of crimson red/beige, side sills and buffer cladding also in crimson red. Two rows of side vents, no end skirting, and single-arm pantographs. Used in IC service. The locomotive looks as it did in the second half of the Eighties. Model: The locomotive has an mfx digital decoder and extensive sound functions. It also has controlled high-efficiency propulsion. 3 axles powered. Traction tires. The triple headlights and dual red marker lights change over with the direction of travel, will work in conventional operation, and can be controlled digitally. The headlights are maintenance-free, warm white LEDs. The engineer's cab has interior details, a figure of a locomotive engineer, and lighting that can also be controlled digitally. The locomotive has separately applied grab irons. It also has roof equipment details. Length over the buffers 21.9 cm / 8-5/8". Production limited to 999 pieces. Prototype: "Blue Star Train" (BST) class 601 diesel powered rail car train. The train is owned by the firm Eisenbahn und Sonderwagen Betriebsgesellschaft mbH (ESG). 1 type Dü powered end car with a baggage compartment and the BST logo in a blue/white paint scheme. 1 powered end car in a blue/white and red/beige paint scheme and the TEE logo. Intermediate cars each in a blue/white paint scheme. The train looks as it currently does in real life. Model: This is a 7 unit train. It has an mfx digital decoder and extensive sound functions. Each powered end car has controlled high efficiency propulsion. 1 truck powered on both axles for each powered end car. Traction tires. The intermediate cars have factory-installed interior lighting. The triple headlights and dual red marker lights change over with the direction of travel. They along with the interior lighting will work in conventional operation, and can be controlled digitally. The interior lighting and the headlights are maintenance-free warm white LEDs. The power is picked up in the front powered end car, depending on the direction of travel. There are special multi-conductor current-conducting couplings and tightly fitting diaphragms with guide mechanisms between the cars. A reproduction of the closed Scharfenberg coupler (non-working) is at both ends of the train. Train length over the couplers 150.9 cm / 59-3/8". With sound and Telex couplers! Prototype: German Federal Railroad (DB) class 261 switch engine. Diesel hydraulic drive with a jackshaft. Model: The locomotive has an mfx digital decoder and extensive sound functions, controlled high-efficiency propulsion, and Telex couplers. 3 axles and the jackshaft powered. Traction tires. The headlights will work in conventional operation and can be controlled digitally. The locomotive has metal platform railings. Length over the buffers 12 cm / 4-3/4". Remote-controlled uncoupling with Telex couplers. Prototype: German Federal Railroad (DB) class 41 freight steam locomotive with a tender and coal firing. Rebuilt version locomotive with new design, high-efficiency boiler, type 2Ž2ŽT34 coal tender, Witte smoke deflectors, DB Reflex glass lanterns, inductive magnet on one side, and buffer plate warning stripe. Road number 41 069. The locomotive looks as it did around 1960. 43118 -- Intermediate Cars for the "Blue Star Train"
Prototype: Intermediate cars for the BST class 601 "Blue Star Train" diesel powered rail car train in a blue/white paint scheme. The cars looks as they currently do in real life. Model: This is a 3 part car set is for lengthening the 37608 BST diesel powered rail car train to a maximum 10 car train. The set consists of 1 compartment car, 1 open seating car, and 1 galley car with a dining area. All of the cars have factory-installed interior lighting. Maintenance-free warm white LEDs are used for the lighting. The dining area in the galley car also has lighted table lamps. A continuous electrical connection through the entire train supplies the interior lighting and the table lamps with power. There are special multi-conductor current-conducting couplings and tightly fitting diaphragms with guide mechanisms between the cars. This set lengthens the train by 62.9 cm / 24-3/4". Prototype: Type Kklm 505 low side car. Fictitious Christmas design. Model: The low side car comes loaded with a snowball with a Christmas design in the form of a car body. The car has close couplers with a guide mechanism. Length over the buffers 11.5 cm / 4-1/2". DC wheel set 2 x 700580. Christmas snowball - can be removed from the freight car. Attractive addition to the Christmas car series. Prototype: Privately owned refrigerator car painted and lettered for the brewery Distelhäuser. Model: The refrigerator car has a brakeman's cab. The car is imprinted in several cars with a theme for the brewery Distelhäuser. Length over the buffers 11.0 cm / 4-5/16". DC wheel set 700270. The flatbed truck is made of metal and plastic. It is painted and lettered as the company truck for the brewery Distelhäuser. It comes loaded with 10 barrels made of real wood. Prototype: Older design refrigerator car with a brakeman's cab. Model: Old-timer car in a Christmas paint scheme. Length over the buffers 40 mm / 1-9/16". One-time series exclusively in 2012. The Christmas car for 2012 comes in a clear plastic truck. The latter can be hung on a Christmas tree with a cord included in the package and continues the series of festive themes from previous years. 87281 -- IC Car Set, 1st Class. Prototype: IC car set, 1st class, consisting of 1 each type Avmz 111.2 compartment car, 1st class, 1 each type Apmz 121.2 open seating car, 1st class, and 1 each type WRmh 132 dining car, all of the cars painted and lettered for the German Federal Railroad (DB). Model: The car set consists of 3 cars, 1st class. All of the cars have extensive, fine, prototypical paint schemes and lettering. The wheels are dark plated. Total length over the buffers approximately 360 mm / 14-3/16". All of the cars are in a special edition, not available separately. This car set forms a prototypical train when combined with 88543 and 87282. 87282 -- IC Car Set, 2nd Class. Prototype: IC car set, 2nd class, consisting of 2 each type Bm 235 compartment cars, 2nd class, and 1 each type Bpmz 291.2 open seating car, 2nd class, , all of the cars painted and lettered for the German Federal Railroad (DB). Model: The car set consists of 3 cars, 2nd class. All of the cars have extensive, fine, prototypical paint schemes and lettering. The wheels are dark plated. Total length over the buffers approximately 360 mm / 14-3/16". This car set forms a prototypical train when combined with 88543 and 87281. Prototype: German Railroad Inc. (DB AG) class 120.1 general-purpose express locomotive. Promotional paint scheme "Märklin my world". Model: Both trucks are powered. The wheel treads are dark nickel plated. The triple headlights change over with the direction of travel. The locomotive has a 5-pole motor. Length over the buffers 87 mm / 3-7/16". The 88526 electric locomotive is only being produced in a one-time series. Prototype: German Federal Railroad (DB) class 103.1 electric locomotive in a "simplified TEE paint scheme" of crimson red/beige, side sills also in crimson red. Two rows of side vents and single-arm pantographs. Used in IC service. The locomotive looks as it did in the mid-Eighties. Model: The locomotive has an extensive, fine paint scheme and lettering. It also has a powerful 5-pole motor. The locomotive has warm white LEDs for headlights that change over with the direction of travel. Both trucks powered. A concealed switch is mounted on the locomotive for selecting working catenary operation. Length over the buffers 88 mm / 3-1/2". The 88543 locomotive forms a prototypical train when combined with 87281 and 87282. Production limited to 555 pieces. Prototype: "Blue Star Train" (BST) class 601 diesel powered rail car train. The train is owned by the firm Eisenbahn und Sonderwagen Betriebsgesellschaft mbH (ESG). 1 type Dü powered end car with a baggage compartment and the BST logo in a blue/white paint scheme. 1 powered end car in a blue/white and red/beige paint scheme with the TEE logo. Intermediate cars each in a blue/white paint scheme. The train looks as it currently does in real life. Model: Both powered end cars have a 5-pole motor with 4 axles in each car powered. Warm white LEDs are used for the headlights on the powered end cars and maintenance-free LEDs for the interior lighting on the intermediate cars. There are close-coupled, special connections between the cars that can be used only on this train. The ends of the train have a representation of the covered Scharfenberg coupler (non-working). Train length 593 mm / 23-3/8". Exclusively for die MHI / "Exclusiv" program. One-time series and strictly limited to 555 pieces worldwide! The "Blue Star Train" or "Probably the Longest Restaurant in the World" Since April of 2006 the former TEE diesel powered rail car train (VT 11 5006, 5015 and intermediate cars) has been located as the so-called "Blue Star Train" (BST), a stationary restaurant, in the Augsburg railroad park. The earlier history of this former flagship of the German Federal Railroad reads almost like a fairy tale: The Augsburg gastronome Jürgen Drexler discovered the VT 11.5 in 2005 in Bodio in the Ticino region of Switzerland, where the train had been stored since June of 2004 and where it was greatly defaced in the meantime by vandalism and graffiti. After several months of negotiations the firm Eisenbahn­ und Sonderwagen­ Betriebsgesellschaft mbH (ESG) / Railroad and Special Car Operating Company, Inc., with its CEO Jürgen Drexler, succeeded in acquiring the train. The train acquired by ESG is the former IC "Max Liebermann" that was operated between Hamburg and Berlin under contract by the East German State Railroad (DR) in 1990 after the reunification and that thereby reawakened the TEE mystique. After that the interior of the train was adapted by Rail Italy Srl to the "Italy Express". After a further change of ownership to SBB Cargo Italia the train was transferred to Bodio in the Ticino region in June of 2004, where the train was stored until August of 2005. The ESG team was able to restore the VT 11.5 to a presentable state. In Switzerland this train was given the blue/white paint scheme in the old ESG company colors instead of the original red/beige TEE paint scheme. 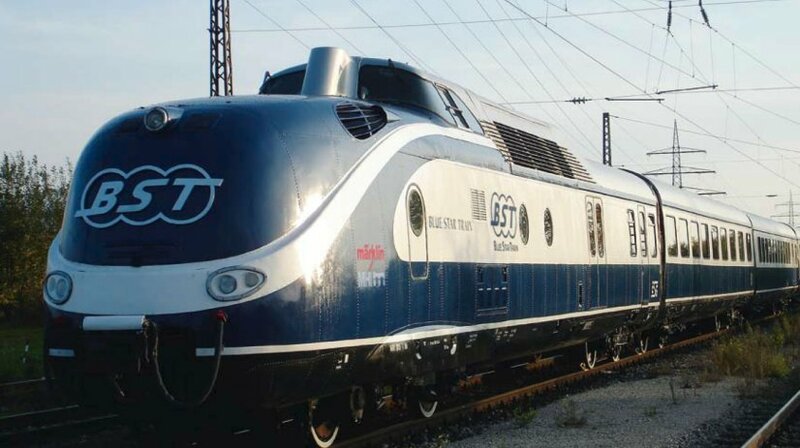 In August of 2005 the ESG was finally able to have the train moved to Augsburg. Since this "Swiss" VT 11.5 only had seven intermediate cars, the search was on for additional cars to augment the train and to provide more efficient operations. ESG found intermediate cars stored at the DB maintenance facility in Kassel and acquired them from the railroad. In Augsburg the individual former TEE powered rail car train end units and intermediate cars were examined in the fall of 2005 to determine which parts could still be used for the subsequent conversion. In the spring of 2006 restoration and conversion work was finished and an exclusive, operational restaurant train with the "dignified luxury" and the flair of the old TEE was the result. At the start of February 2010 the powered end car VT 11 5006 for the "Blue Star Train" was repainted in its front area in the classic TEE colors of red/beige and had the original TEE emblem applied to the nose. In contrast a BST logo in the style of the TEE emblem is mounted on the other powered end car. With this "exclusive" paint scheme the ESG is documenting impressively in the TEE anniversary year its close link to the 50 year old history of its train. It is in any event the first and only TEE powered rail car train in private hands and at the same time the only one painted in other than the original TEE colors. Prototype: 2 class 185.6 electric locomotives painted and lettered for the firm Lokomotion Gesellschaft für Schienentraktion mbH, Munich, Germany, for service to the Brenner Pass in Austria, frequently used in m.u. operation. Dual system locomotives built by Bombardier as regular production locomotives from the TRAXX family of locomotive types. Use: freight service. Model: The locomotives have the new 14-pin digital connector. They also have a 5-pole motor with 2 flywheels. 4 axles powered. Traction tires. The headlights and the marker lights change over with the direction of travel and can be shut off by means of a new bridge plug. The headlights are warm white LEDs. The locomotives have a close coupler mechanism. The locomotives have engineer's cab lighting and long distance lights that can be activated with the new 66840 decoder. Both locomotives are individually packaged. Length over the buffers per locomotive 118 mm / 4-5/8". Prototype: German Federal Railroad (DB) class 41 freight steam locomotive with a tender and coal firing. Rebuilt version locomotive with new design, high-efficiency boiler, type 2´2´T34 coal tender, Witte smoke deflectors, DB Reflex glass lanterns, inductive magnet on one side, and buffer plate warning stripe. Road number 41 069. The locomotive looks as it did around 1960. Model: The locomotive has a DCC decoder and extensive sound functions. It also has controlled high-efficiency propulsion with a bell-shaped armature and a flywheel, mounted in the boiler. 4 axles powered. Traction tires. The locomotive and tender are constructed mostly of metal. A 7226 smoke generator can be installed in the locomotive. The triple headlights change over with the direction of travel. They and the smoke generator contact will work in conventional operation and can be controlled digitally. The headlights are maintenance-free warm white LEDs. There is a close coupling with a guide mechanism between the locomotive and tender and it can be adjusted for curves. The front of the locomotive and the back of the tender has a close coupler in an NEM pocket with a guide mechanism. Minimum radius for operation is 360 mm / 14-3/16". Piston rod protectors and brake hoses are included. Length over the buffers 27.5 cm / 10-13/16". This model can be found in an AC version in the Märklin H0 assortment under item no. 37922. Prototype: French State Railways (SNCF) class 150 Z (former class 50) freight train steam locomotive, with a coal tender as standard design type 2´2´T26 box-style tender in its original design. With Wagner smoke deflectors, standard engineer's cab, long walkway that is angled at the front to the smoke box, DRG lanterns, and without an inductive magnet. Road number 150 Z 095. The locomotive looks as it did around at the end of the Forties / beginning of the Fifties. Model: The locomotive has a DCC decoder and extensive sound functions. It has controlled high efficiency propulsion with a bell-shaped armature and a flywheel, mounted in the boiler. 5 axles powered. Traction tires. The locomotive and the tender are constructed mostly of metal. A 7226 smoke generator can be installed in the locomotive. The dual headlights change over with the direction of travel. They and the smoke generator that can be installed in the locomotive will work in conventional operation and can be controlled digitally. The headlights are maintenance-free, warm white LEDs. There is a close coupling with a guide mechanism between the locomotive and tender and it can be adjusted for curves. The front of the locomotive and the back of the tender has a close coupler in an NEM pocket with a guide mechanism. Minimum radius for operation is 360 mm / 14-3/16". Piston rod protectors and brake hoses are included. Length over the buffers 26.4 cm / 10-3/8". This model can be found in an AC version in the Märklin H0 assortment under item no. 37813.